“It wasn’t always easy for Shante Needham to have cameras following her and her family through some of the rawest, most challenging trials of their lives. ‘Honestly, it was a bit much at times, especially when I was having a down day,’ she told the Guardian. It was 2015 and Needham’s sister Sandra Bland had just been found dead in her jail cell in Waller county, Texas, after having been arrested during a routine traffic stop. In the midst of the burgeoning Black Lives Mattermovement, questions about Bland’s arrest and death had quickly begun to draw headlines and steer conversations about the ways black women were subjected to police violence – popularizing the refrain ‘say her name’. In the early moments following her death, film-makers Kate Davis and David Heilbroner contacted Bland’s family and asked to follow their fight to learn exactly what had occurred to the outspoken 28-year-old they all knew as Sandy. 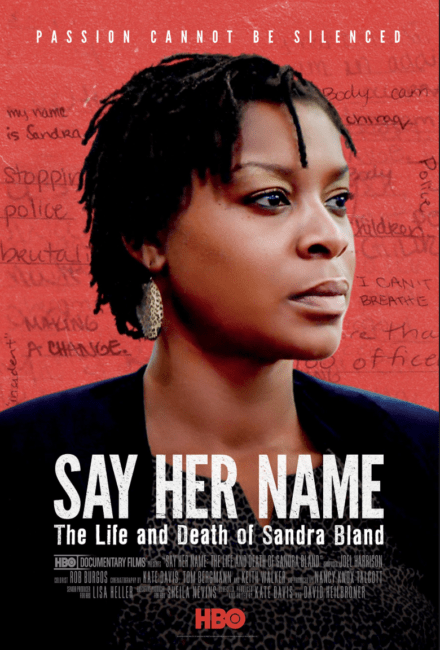 The ensuing two-year odyssey of surveillance videos, autopsies, lawsuits and protests were captured in the HBO documentary film Say Her Name: The Life and Death of Sandra Bland.